The new exhibition takes place in the environmental center, the building can be seen here in front of the orange colored sodium vapour lights of the village Schopfloch. The milky way stretches across the bright patch of light pollution of the city of Stuttgart. 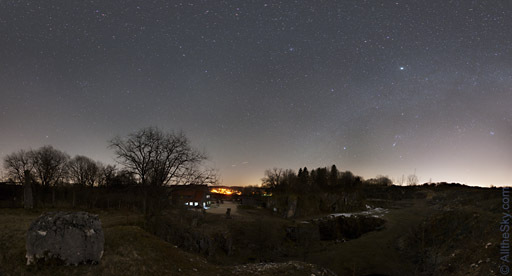 Photographies of the night show a natural illuminated landscape with a starry sky, but also the impact of light pollution. Opening is September 28th at 3 pm with a talk by astrophysicist Günther Wuchterl, who was awarded with the Galileo price by the IDA (International Dark Sky Association).